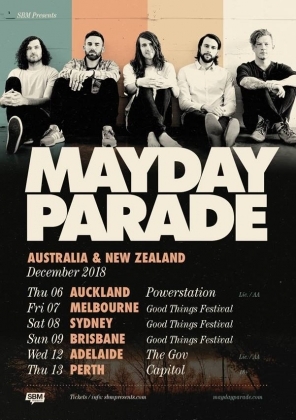 Mayday Parade have just announced they will be doing Headlining shows across Australia & New Zealand alongside their already announced appearances at GOOD THINGS FESTIVAL! The Florida rockers will headline dates in Adelaide and Perth, off the back of their latest album Sunnyland. The group’s all-ages Adelaide show will feature support slots from Bad Juju and Yours Truly, while the Perth show will feature Yours Truly & Homestate. Having sold out multiple shows on their last tour down under tickets are expected to sell out for Mayday Parade’s Welcome To Sunnyland Tour!